URL posting issues on Facebook | personal.amy-wong.com - A Blog by Amy Wong. Is anyone else having issues with sending messages on Facebook groups? You know that “Message All Members” option. I mean, if I am a member of a group, I know I am subjected to any message the group administrator might want to send me… and yes, that includes links. Now, if Facebook is a social network… and Groups are a cyber-social way of people who have something in common to share links, comments, news, etc. – why would Facebook block websites? And why our websites? Who is the one flagging my/our URLs? Because it wasn’t only my address on that message I was trying to send. So in the message, I was trying to pimp YAM’s two new official Facebook officers – Erick over at Toma-Uno.com who’s now the Facebook Second-in-Command, and Linzer Dinzer who’s now added to the Facebook Officer list. Plus, our fave Film hangouts who are on Facebook groups and pages~~~ As well as our latest Cinencuentro article in Spanish and English. But couldn’t sent, because Facebook blocked websites. So I changed all the links to ow.ly links, fail again! Deleted the links to the Facebook groups, fail again! Deleted mine! Fail again. Changed Cinencuentro’s to the Facebook URL shortener, fail again! It wasn’t until I deleted ALL the links, that it let me send the message – which in the end is pointless, right? I mean, what’s a bunch of names if there’s no links? It happened to me once before with YAM Magazine’s URL, so I used the “report this error” link on the Facebook Error Message, but I haven’t been contacted by Facebook, and I’ve read of people still waiting after six months… SIX Months!!! So I’m asking you this – what to do? should I avoid links? and write things like amy-wong dot com? 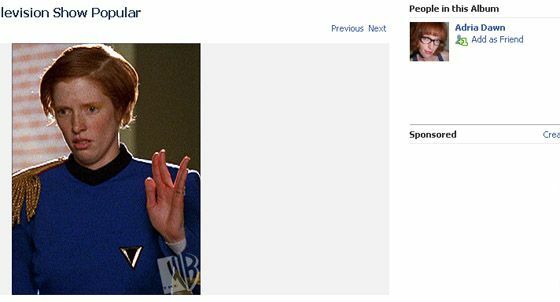 Also… on a side note- I was browsing the The WB’s Popular group’s photos, and ended up looking at this photo of April Tuna played by Adria Dawn doing the Star Trek sign, and ended up with a link to Dawn’s actual Facebook profile. Facebook creepy, or not?